Posterior ligaments of the pelvis. 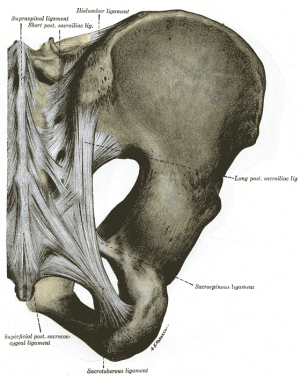 The long dorsal sacral ligament test is a pain provoking test typically used in combination with the posterior pelvic pain provocation test and the active straight leg raise test (ASLR) when a patient presents with lumbopelvic and/or sacroiliac joint pain. The long dorsal sacral ligament originates from the posterior superior iliac spine (PSIS) attaches to the lateral crest of the third and fourth sacral segments . It has close relations with the aponeurosis of the erector spinae muscle, the posterior layer of the thoracolumbar fascia and the sacrotuberous ligament. Counternutation in the sacroiliac joint increases tension on the long dorsal sacral ligament, whilst nutation will slacken the ligament. The ligament is superficial and can be palpated just caudal to the posterior superior iliac spine (PSIS). The sum score can be situated between 0-6 because the scores on both sides are added. The patient lies on her side with slight flexion in both hip and knee joints. If the pain caused by the palpation remains for more than 5 seconds after the examiner removes his hand, it is considered as pain. It is considered as tenderness when the pain disappears within 5 seconds. DeVries et al (2007) found that the long dorsal ligament test had a high sensitivity and specificity when a unilateral cut-off score of ≥ 2 was used and when patients indicated moderate or severe pain. They found previous studies were not in agreement about interrater reliability with Kappa ranges from 0.34 - 0.76. They noted further that the examiner required adequate training in the anatomy of the area to accurately locate the ligament, and that patients who had no pathology could report pain on palpation of this region. ↑ Vleeming A, Pool-Goudzwaard AL, Hammudoghlu D, Stoeckart R, Snijders CJ, Mens JM. The function of the long dorsal sacroiliac ligament: its implication for understanding low back pain. Spine. 1996 Mar 1;21(5):556-62. ↑ 4.0 4.1 4.2 Vleeming A, Albert HB, Östgaard HC, Sturesson B, Stuge B. European guidelines for the diagnosis and treatment of pelvic girdle pain. European Spine Journal Jun 2008; 17(6) : 794-819. ↑ De Vries H, Vleeming A, Ronchetti I & Wingerden J Pelvic girdle pain: the sensitivity and specificity of the Long Dorsal Sacroiliac Ligament test. Proceedings of the Interdisciplinary World Congress on Low Back & Pelvic Pain; 2007; Barcelona, Spain. Volume 6.